rriage and fa mi ly. BY PHONE: Call our Department of Development at 609-403-7197 with your credit card information. ANNU AL C AT H O LI C AP P EAL A3 Thank you for your generosity. Your donation is important in building up our Church. Gifts of cash, check, money order, credit card or electronic transfers from your bank account are gratefully accepted. Gifts of stock, IRA distributions, bequests and charitable annuities can be coordinated by contacting the Department of Development at 609-403-7197. BY MAIL: Send a check or money order made payable to Annual Catholic Appeal: ONLINE: Access our secure website at www.dioceseoftrenton.org/catholicappeal to easily make a pledge, payment or outright gift. hen pastors are asked what makes the Annual Catholic Appeal successful, they are quick to highlight the generosity of their parishioners, embracing the vision, adherence to a plan of action, and the importance of prayer. 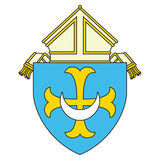 Appeal planners also point to the critical role of pastors, who teach and witness to the important mission of the Annual Catholic Appeal, covering such initiatives as helping the poor, the elderly, families and retired religious, as well as ministries of evangelization, communication and vocations. “[It allows] my parishioners to see what is going on throughout the Diocese.” It’s a combination that brought the 2018 Annual Catholic Appeal, “What Does Love Look Like?” to a successful close in December. The appeal raised $6.2 million of a $7 million goal, an increase of $600,000 over the previous year’s appeal. 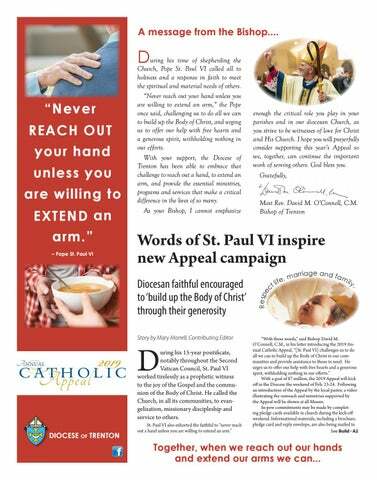 sis t t h e p o o r.
This year, with your support, the Diocese will continue to be able to feed and nurture the family of God through our parishes, our ministries, and our schools.” Donations to the Annual Catholic Appeal may be made by mail, on-line or by phone. For more information call 609-4037197 or visit dioceseoftrenton.org/catholicAppeal. Your Gift Matters! Your donation is important in building up our Church. Gifts of cash, check, money order, credit card or electronic transfers from your bank account are gratefully accepted. Gifts of stock, IRA distributions, bequests and charitable annuities can be coordinated by contacting the Department of Development at 609-403-7197. Through your generous and sacrificial gift, you not only embrace Pope St. Paul VI’s challenge, you embrace your brothers and sisters in the Lord, as well. ONLINE: Access our secure website at www.dioceseoftrenton.org/catholicappeal to easily make a pledge, payment or outright gift. BY MAIL: Send a check or money order to our processing center, made payable to Annual Catholic Appeal: Diocese of Trenton PO Box 70170 Newark, NJ 07101 BY PHONE: Call our Department of Development at 609-403-7197 with your credit card information.